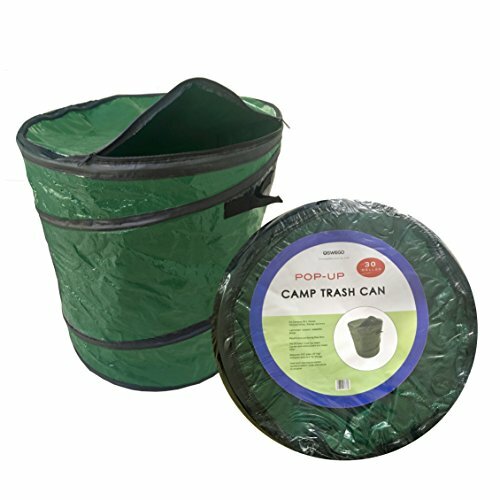 Oswego's 30 Gallon Travel and Camping Trash and Recycle containers are a compact, portable solution for managing garbage and recycling at the campsite or on the road. Made of sturdy polyethylene and spring steel wire, our 30 Gallon size stands 22" tall and 19" wide (48cmx56cm). Pair with 30-32 gallon garbage can liners, or use without liners and clean by light rinsing or wiping with a damp cloth. Zipper top lid closes off contents from wind and rain, keeping the inside dry and preventing spills. Button-and-Loop system located at bottom of container allows it to be folded down to 1-2" for storage (loops are located on inside of bag). 30 GALLON FAMILY SIZE of our popular outdoor trash container. Great for camping, barbecues, the beach, parties, and garden clean-up. ZIPPERED LID allows contents to be sealed inside, keeping out dust, dirt, rain and camp critters. EASY CARRY AND COMPACT STORAGE. Folds down to one inch for storage. Three handles, two on top and one on bottom for easy portability. DURABLE YET LIGHTWEIGHT. Made from sturdy, water-resistant polyethylene and spring steel wire. DIMENSIONS 19" Wide X 22" Tall when standing (48x56 cm). Can be used with 30-32 gallon garbage can liners. Or use without liners and rinse or wipe clean. View More In Outdoor Trash Cans. If you have any questions about this product by Oswego, contact us by completing and submitting the form below. If you are looking for a specif part number, please include it with your message.